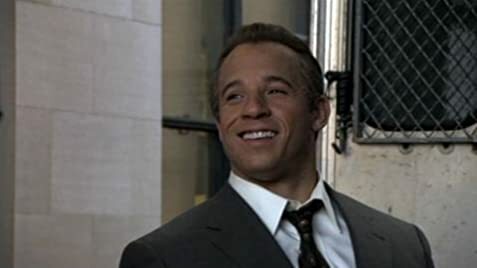 | I have to say that Vin Diesel isn't anything like I expected him to be in this role. He did an amazing job. I went to a screening in NYC this week, and Vin's performance knocked the socks off of everyone in attendance. The physical transformation was astonishing. He gained a lot of weight for this role, and many of the people around me (myself included) did not recognize him when he first appeared on screen. While watching the film, I totally forgot that I was watching Vin Diesel. He really became the character for me. Annabella Sciorra is another actor I will never look at the same way again. She had exactly one scene in the movie and I thought the screen was going to burst into flames or something. It was really that hot. She and Vin barely touched each other ... didn't even so much as kiss ... and I swear the entire audience needed a cigarette afterward. The entire cast was first-rate. Every single one of them hit the ball out of the park, no exceptions. The 2+ hours of running time went by like 15 minutes, and I sincerely did not want the movie to end. There was a Q&A session after the screening, and Vin was humble, funny, personable and sometimes boyish in his interactions with the audience. I wasn't a big Vin fan before this movie, but now I can't wait to see him in Hannibal. This guy isn't just an action star ... he's a very talented, dedicated and capable actor. Giacomo "Jackie" DiNorscio died on November 14, 2004, during the film's production. While the movie is set in the late 1980s, many of the cars seen in some of the outdoor scenes were not produced until the late 1990s or early 2000s. For example, in one outdoor scene before the verdict is read, a 2004/2005 Mercedes 350SC or 500SC is clearly seen.